How Much Will Refranchising Boost Coca-Cola’s Margins in 2018? How Is Coca-Cola Expected To Perform In The Third Quarter? Is Coca-Cola Brewing A Cannabis Partnership? Why Is Coca-Cola Paying A Hefty Premium For Costa Coffee? Can Diet Coke Continue Its Surprisingly Good Performance In The Second Quarter? Is Coca-Cola Diversifying Into Alcoholic Drinks? Can Refranchising Efforts Lead To A Margin Improvement For Coca-Cola In The First Quarter? Can Coca-Cola Manage To Increase Its Revenue And Profitability By Slashing Its Advertising And Marketing Expenditure Over The Next Two Years? It has been a long time since both, Coca-Cola (NYSE:KO) and PepsiCo (NASDAQ:PEP), diversified into segments other than carbonated soft drinks (CSD) by selling juices, water, sports drinks, iced coffee, snacks, and other beverages. Though Coca-Cola is still the king when it comes to regular cola, PepsiCo has been able to capitalize on its diverse offerings in a much better way, which has helped the company to consistently record revenues much higher than that of Coke. In 2018, PEP reported revenues of $64.7 billion as against $31.9 billion by KO with margin improvement seen for both companies. However, if we look at how much both the companies spend on advertising and marketing (A&M), it would give a completely different picture. 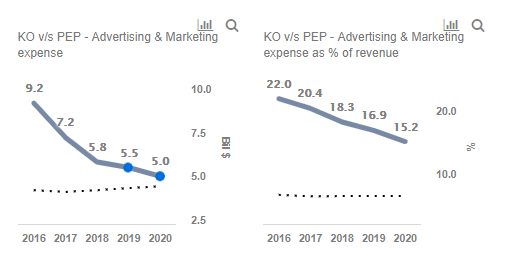 In spite of advertising and marketing campaigns being the main driver of sales growth for a food and beverage company, PEP’s marketing and ad expense was much lower than KO’s. We believe that Coca-Cola could consider a change in its advertising and marketing methods, making them more focused and digital, with emphasis on healthy products and minimum spending on the bottling business. This strategy is likely to help KO narrow its gap with PEP by achieving better revenue growth while cutting down on its advertising expenses, thus giving a fillip to margins and earnings, while at the same time increasing its potential upside to share price and return to investors. We have summarized the key expectations about KO’s revenue, margins, earnings, and stock price, and compared the same with that of PepsiCo in our interactive dashboard – What is the revenue and earnings potential for Coca-Cola by cutting down on its advertising and marketing expenditure over the next two years? In addition, here is more Consumer Staples data. Marketing Expenditure and Strategy – What was and what could be? Coca-Cola utilizes its ad and marketing budget on print, radio, television and other advertisements, marketing campaigns, point-of-sale merchandising and sales promotion. However, a major part of its advertising expense has historically been directed towards its bottling operations. With KO refranchising most of its bottling business over the last couple of years, the company’s A&M expenditure and revenue have significantly declined in tandem. However, Coca-Cola’s marketing spend ($5.8 billion or 18.3% of revenue in FY 2018) is still much higher compared to PepsiCo’s ($4.2 billion or 6.5% of revenue in FY 2018). This is mainly a reflection of PEP’s lower spending on its bottlers and much more focus on catering to the health-conscious audience with most of its marketing budget being reserved for health snacks, sports drinks and non-carbonated beverages. 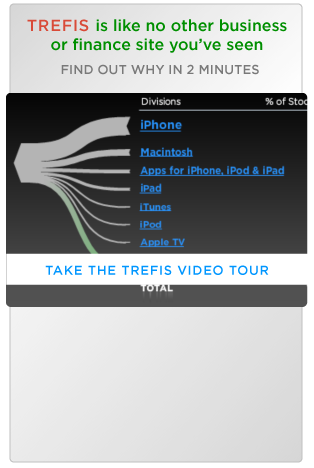 Additionally, compared to Coca-Cola, PepsiCo focuses much more on digital marketing. With most of its refranchising already done, Coca-Cola is expected to find it very tough to further reduce its advertising expenditure if it sticks to its current strategy. In stead, KO should cut down on its ad spend for bottlers and divert most of its budget away from soda. An increased focus on pushing healthy products, ready-to-make tea/coffee and non-carbonated beverages would provide a tough competition to PepsiCo in the segment. Additionally, KO could emphasize on digital marketing (the way Anheuser-Busch has been able to do in China) with tie-ups with e-commerce companies or enhancing its own online presence with its app, which could help the company reach a larger audience at a much lower cost. A cut-down on print and television would help the company save a lot of its cost, a part of which could be redirected towards positioning itself as a serious competitor to PepsiCo in the healthy products category. This is likely to help Coca-Cola decrease its advertising and marketing expenditure over the next two years. Additionally, such a focused strategy could increase revenue by 1.5%-2.0% during this period, as against a revenue decline over the last 3 years. Assuming that PepsiCo continues with its current, highly effective strategy, Coca-Cola would be able to significantly reduce its gap with PepsiCo with a projected A&M spending of $5 billion in 2020, as against PEP’s estimated expense of $4.3 billion. Coca-Cola’s margins are higher than PepsiCo’s due to refranchising of its low-margin bottling business. However, with the expected reversal of revenue trend and decline in costs with a change in marketing strategy, KO’s net income margin is expected to increase from 20.2% in 2018 to 21% and 22% in 2019 and 2020, respectively, much higher compared to PEP’s margin which is likely to hover around 8.5% to 9% over the next two years. 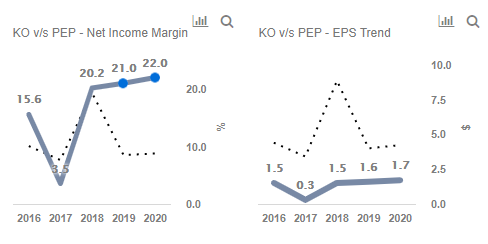 Along with higher margins, an increase in revenues (due to higher sales of non-carbonated products) would likely lead to a much healthier growth in EPS and stock price for KO as compared to PEP. We currently have a price estimate of $50 for Coca-Cola’s share. However, if the company manages to alter its marketing and advertising program, the expected fundamental stock value could rise to $55 in 2020. This would mark a CAGR of 10.4% in 2019 followed by 10.1% in 2020 over its current market price of ~$45. This potential double-digit return for two consecutive years is much more than PepsiCo’s expected CAGR of 3.3% and 4.6% in 2019 and 2020, respectively. Thus, Coca-Cola could go a long way in capturing a larger market in the healthy products category by tweaking its advertising spending, while creating value at a faster pace for its investors.